سکہ Tuman, Abbasi (incl. Abazi)، Shahi. ↑ Matthee* Matthee, Rudi (1 ستمبر 2009). 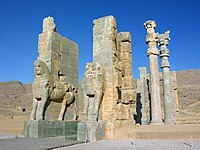 "Was Safavid Iran an Empire?". Journal of the Economic and Social History of the Orient 53 (1): 241. doi:10.1163/002249910X12573963244449. "The term 'Iran'، which after an absence of some six centuries had re-entered usage with the Ilkhanid branch of the Mongols, conveyed a shared self-awareness among the political and cultural elite of a geographical entity with distinct territorial and political implications. A core element of the Safavid achievement was the notion that the dynasty had united the eastern and western halves of Iran, Khurasan and Herat, the lands of the Timurids, in the East, and the territory of the Aq-Quyunlu in the West. The term mulk-i vasi' al-faza-yi Iran, 'the expansive realm of Iran'، found in the seventeenth-century chronicle, Khuld-i barin, and again, in near identical terms, in the travelogue of Muhammad Rabi Shah Sulayman's envoy to Siam in the 1680s, similarly conveys the authors pride and self-consciousness with regard to the territory they inhabited or hailed from.". ↑ Savory, Roger (2 جنوری 2007). "The Safavid state and polity". Iranian Studies 7 (1–2): 206. doi:10.1080/00210867408701463. 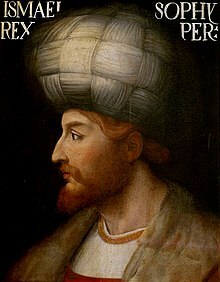 "The somewhat vague phrase used during the early Safavid period, mamalik-i mahrusa, had assumed more concrete forms: mamālik-i īrān; mamālik-i 'ajam; mamlikat-i īrān; mulk-i īrān; or simply īrān. The royal throne was variously described as sarīr-i saltanat-i īrān; takht-i īrān; and takht-i sultān (sic)-i īrān. The inhabitants of the Safavid empire are referred to as ahl-i īrān, and Iskandar Beg describes himself as writing the history of the Iranians (sharh-i ahvāl-i īrān va īrāniān)۔ Shah Abbas I is described as farmānravā-yi īrān and shahryār-i īrān; his seat is pāyitakht-i pādishāhān-i īrān, takhtgāh-i salātin-i īrān, or dār al-mulk-i īrān. His sovereign power is referred to as farmāndahi-yi mulk-i īrān, saltanat va pādishāhi-yi īrān, pādishāhi-yi īrān. The cities of Iran (bilād-i īrān) are thought of as belonging to a positive entity or state: Herat is referred to as a'zam-i bilād-i īrān (the greatest of the cities of Iran) and Isfahan as khulāsa-yi mulk-i īrān (the choicest part of the realm of Iran)۔ … The sense of geographical continuity referred to earlier is preserved by a phrase like kull-i vilāyat-i īrānzamīn. … Affairs of state are referred to as muhimmāt-i īrān. To my mind however, one of the clearest indications that the Safavid state had become a state in the full sense of the word is provided by the revival of the ancient title of sipahsālār-i īrān or "commander-in-chief of the armed forces of Iran"۔". ↑ "۔.۔ the Order of the Lion and the Sun, a device which, since the 17 century at least, appeared on the national flag of the Safavids the lion representing 'Ali and the sun the glory of the Shiʻi faith"، Mikhail Borisovich Piotrovskiĭ، J. M. Rogers, Hermitage Rooms at Somerset House, Courtauld Institute of Art, Heaven on earth: Art from Islamic Lands: Works from the State Hermitage Museum and the Khalili Collection، Prestel, 2004, p. 178. ↑ Flaskerud, Ingvild (2010). Visualizing Belief and Piety in Iranian Shiism. A&C Black, 182–3. ISBN 978-1-4411-4907-7. ↑ Ronald W Ferrier, The Arts of Persia۔ Yale University Press. 1989, p. 9. ↑ 10.0 10.1 John R Perry, "Turkic-Iranian contacts"، Encyclopædia Iranica، جنوری 24, 2006: "۔.۔ written Persian, the language of high literature and civil administration, remained virtually unaffected in status and content"
↑ Arnold J. Toynbee, A Study of History، V, pp. 514–515. Excerpt: "in the heyday of the Mughal, Safawi, and Ottoman regimes New Persian was being patronized as the language of literae humaniores by the ruling element over the whole of this huge realm, while it was also being employed as the official language of administration in those two-thirds of its realm that lay within the Safawi and the Mughal frontiers"
↑ Ruda Jurdi Abisaab. "Iran and Pre-Independence Lebanon" in Houchang Esfandiar Chehabi, Distant Relations: Iran and Lebanon in the Last 500 Years، IB Tauris 2006, p. 76: "Although the Arabic language was still the medium for religious scholastic expression, it was precisely under the Safavids that hadith complications and doctrinal works of all sorts were being translated to Persian. The ʻAmili (Lebanese scholars of Shiʻi faith) operating through the Court-based religious posts, were forced to master the Persian language; their students translated their instructions into Persian. Persianization went hand in hand with the popularization of 'mainstream' Shiʻi belief." ↑ Floor, Willem; Javadi, Hasan (2013). "The Role of Azerbaijani Turkish in Safavid Iran". Iranian Studies 46 (4): 569–581. doi:10.1080/00210862.2013.784516. ↑ (1998) The Persian Presence in the Islamic World. Cambridge: Cambridge University Press, 240. ISBN 978-0-521-59185-0. ↑ (2010) The Sword of Persia: Nader Shah, from Tribal Warrior to Conquering Tyrant. I.B.Tauris, 33. ISBN 978-0-85772-193-8. ↑ Ferrier, RW, A Journey to Persia: Jean Chardin's Portrait of a Seventeenth-century Empire، p. ix. ↑ The New Encyclopedia of Islam، Ed. Cyril Glassé، (Rowman & Littlefield Publishers, 2008)، 449. (2009) Shah Abbas: The Ruthless King Who Became an Iranian Legend. I.B.Tauris. ISBN 978-0857716767. (1986) The Timurid and Safavid Periods, The Cambridge History of Iran 6. Cambridge: Cambridge University Press. ISBN 9780521200943. (2015) Historical Dictionary of Georgia, 2, Rowman & Littlefield. ISBN 978-1442241466.